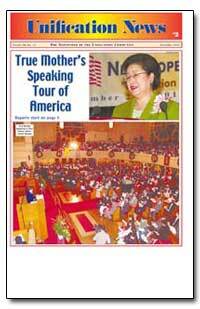 Excerpt: This speech was given on June 22, 2001 at East Garden, Irvington, New York. The translation was by Tim Elder and Hee Hun Standard; unofficial notes by Tyler Hendricks. There were two sessions - this is from the first. 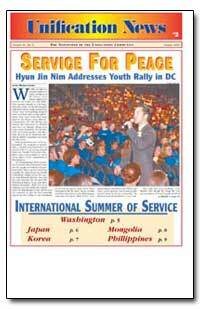 Excerpt: The 2001 Service for Peace Tour has come to a victorious conclusion in our homeland of Korea. With the participation of 15,000 young Koreans, more than 90,000 youths have now witnessed World CARP President Hyun Jin Moon?s passionate appeal to live for the sake of others through the rallies, as well as many others on the internet and through video. Excerpt: Extraordinary times call for extraordinary measures. Former U.S. 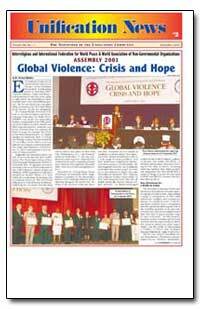 Vice-President Dan Quayle, in welcoming guests to Assembly 2001, ?Global Violence: Crisis and Hope,? told participants that they were going to take part in ?an extraordinary meeting with some very extraordinary people.? 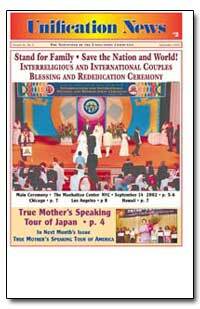 By the end of the four-day gathering, convened at the New York Hilton from October 19-22, few disagreed. 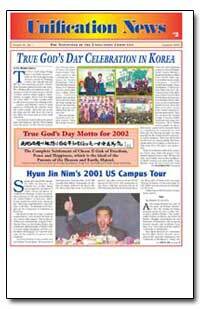 Excerpt: The True God?s Day Pledge Service was held January 1, 2002 at the Cheong Pyeong Heaven and Earth Training Center. Rev. Kwak was the MC for the morning prayer service. True Parents entered in their holy robes. The offering table was glorious with 12 stacks of foods (2 rows deep) of all the creation, Korean pears, apples, strawberries, oranges. About four feet high on a foot table. 7 large candles were evenly placed across the offering table. 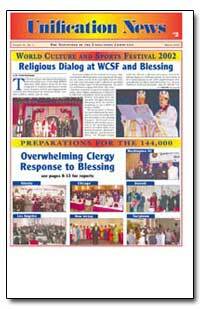 Excerpt: The World Culture and Sports Festival was held in Seoul February 13-20, 2002. 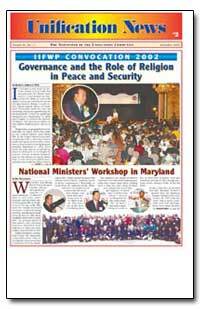 IIFWP?S Assembly 2002 aspect of the WCSF was comprised of elements reflecting the broad array of peace activity and organizations founded and maintained by Reverend Moon - religion, politics, media, and so forth. Excerpt: Thirty ministers and elected officials from Atlanta attended the Chicago and Washington, D.C. National ACLC Convocations. They were deeply moved by their experiences. I thought to myself, ?Wow, can we bring this spirit back to Atlanta?? But we did! 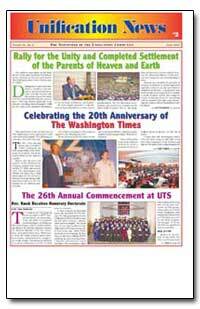 Excerpt: True Parents proclaimed after the Blessing ceremony on April 27 the total victory of the Interreligious and International 144,000 Clergy Couples blessing. 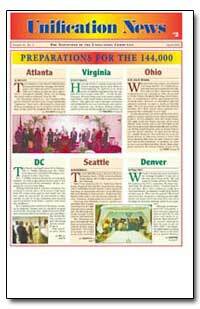 144,000 couples were blessed and offered to heaven. 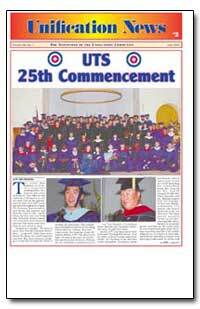 21 clergy couples were matched directly by Father and educated by UTS President Dr. Tyler Hendricks. 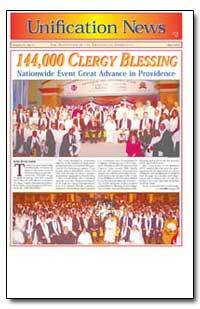 Excerpt: This is from an address given at east Garden to clergy planning the September 14th Blessing. I realized that we must have one philosophy or thought. No religious leaders can do this. Don?t focus on your position with your denomination. Focus on going through the spirit world to get to God. If you don?t know God?s will you may be crying out in the future. Excerpt: This is from a sermon given at East Garden on September 22, 2002 from notes by Rev. Michael Jenkins, translation by Rev. Dong Woo Kim. 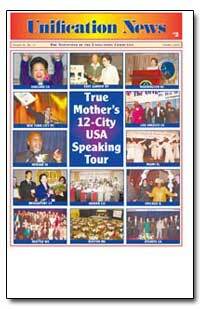 We will hear the spiritual world testimonies today. Those who receive the testimonies will rise, those who reject will decline. The turning point for humanity is coming at this time. Those who support the revelation will rise, those who reject will become fertilizer for the future. 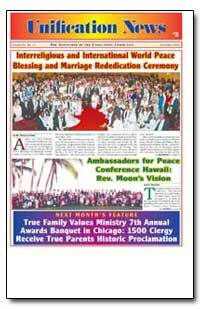 Excerpt: Again, our True Parents established another incredible victory for all mankind through the Interreligious and International World Peace Blessing and Marriage Rededication Ceremony. Over 1200 couples filled the Marriott Crystal Gateway on December 7th. 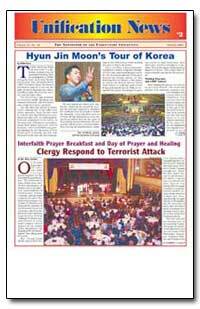 Excerpt: Cheong Pyeong Heaven and Earth Training Center: True Father began his Midnight prayer to offer the New Year of 2003, Cheon Il Guk Year Three. Father concluded the prayer at about ten minutes past midnight, whereupon Rev. Kwak led everyone in offering a thunderous round of applause of appreciation for True Parents? unstinting toil for Heavenly Father?s Will. Excerpt: A full four hour before the start of the morning?s program, February 6th, 2003, the grand hall at Chungpyung Holy Mountain (Chungpyung Lake Heaven and Earth Training Center) was absolutely jam-packed as the first of more than 10,000 expected guests made sure of their place in the historic ?Cheon Il Guk Blessing? of True Parents and of all Blessed Couples.